The Washington Nationals lost game 5 of the NLDS to the St. Louis Cardinals. They lost in heartbreaking fashion, collapsing in the 9th inning and losing the series. This loss was not only heartbreaking because of how it was suffered by because this was the first time that a Washington baseball team had made the playoffs in almost 80 years. That is an insane playoff drought. Washington made a great run this season. Years of high draft picks and solid management allowed Washington to put together a fantastic rotation and a decent offense. They finished the season with the best record in baseball. They also called up Bryce Harper, who, with the exception of Mike Trout, is the most exciting young player in baseball. Harper will likely be a fan favorite for years to come and should be a big draw for the Nationals. I, for one, hope that he lives up to the hype and that the Nationals can keep him in Washington. It’s good for the team and for baseball to have guys who define teams. The MLB would really lose something if guys like Jeter, Ripken, Gwynn, and George Brett didn’t exist. Without those types of guys baseball loses its identity. Nobody wants a league of mercenaries who change teams every three years. Kudos to Washington for what they’ve put together. With players like Harper, Zimmerman, Morse, and Gio Gonzalez their future looks bright, I’m thinking an NL version of the Rays, but with a stronger upside because they are in a better market. 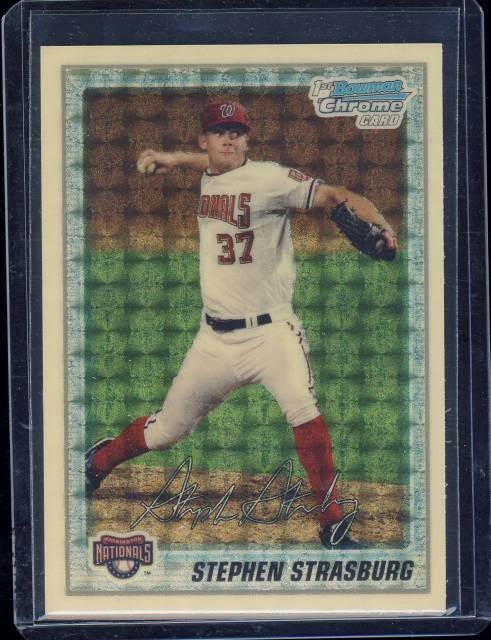 However, I’m here today to talk about Stephen Strasburg, the centerpiece of their rotation for years to come. He’s a guy who threw 197 strikeouts in 159 innings. He had a 3.16 ERA and 1.15 WHIP. He put up a 2.82 FIP (that’s fielding indepenet pitching, click the link if you don’t know about it). Not to mention a 4.3 WAR. He is an ace, a certifiable ace. We all know that, me, you, the pundits, and the hobby. If the Nationals can keep him and Harper healthy and under contract, they are a force to be reckoned with. Washington did not use him in the NLDS. Let me repeat that, they did not use their best arm in the playoffs. I understand that Washington wanted to shut Strasburg down after 160 innings. He is a young pitcher coming off Tommy John surgery and they didn’t want to push his innings ala Mark Prior. They wanted to “protect their investment” for years to come. But why are they invested in him? The answer: to win. They want to build a winning club. But they have built a winning club, this years club. They had the best record in baseball behind the best pitching staff in the majors. They were set to win this year and they blew it because of an artificial innings cap that they created. This could have been their year but they will never know because they wouldn’t allow Strasburg to pitch at least six more innings. One Strasburg start in the NLDS could have made all the difference in the world. They were one win away from moving on. The Nationals set a four man rotation of Gonzalez, Jordan Zimmermann, Edwin Jackson, and Ross Detwiler for the NLDS. In their defense, we saw solid performances out of Gonzalez and Detwiler. Jordan Zimmermann was shelled in game 2 and Jackson in game 3. Now, we know that Zimmermann remains in the rotation even if Strasburg is in it. If Strasburg starts a game then either Jackson or Detwiler are displaced, most likely Detwiler, as he was the fourth starter. Now, you may be saying that you’d basically be replacing one of their solid starters in the series, and you’d be right. But you’d also have a different pitcher for game 2, assuming that Strasburg is slotted as the nubmer 2 starter to avoid giving him two starts, which was a huge loss for the Nats. Strasburg starts game 2 at St. Louis, maybe works some magic and they go back home up 2-0. This takes a lot of pressure off of the other starters, gives Zimmermann a home field advantage and maybe we’re talking about a San Francisco and Washington NLCS. But we’ll never know because Washington decided they weren’t all in for this year. I sincerely hope, for the sake of the Nats fans, that they make the playoffs in the years to come, because if they don’t sitting Strasburg may go down as one of the dumbest moves of all time. You always have to play for this year. Next year may never come (at least the playoffs may not). This card has sold for some ugodly sums of money. He still hasn’t started in the playoffs though. Frowny face for Nats fans. P.S. I’m really tired of the Cardinals.